Sarah Palin Sues 'New York Times,' Says Editorial Defamed Her : The Two-Way The Times editorial, which was corrected later, linked one of Palin's political action committee ads to the mass shooting in January 2011 that severely wounded then-Arizona Rep. Gabby Giffords. Sarah Palin, shown at Politicon 2016 last June in Pasadena, Calif., has accused The New York Times of publishing a statement about her that it "knew to be false." Former Alaska Gov. 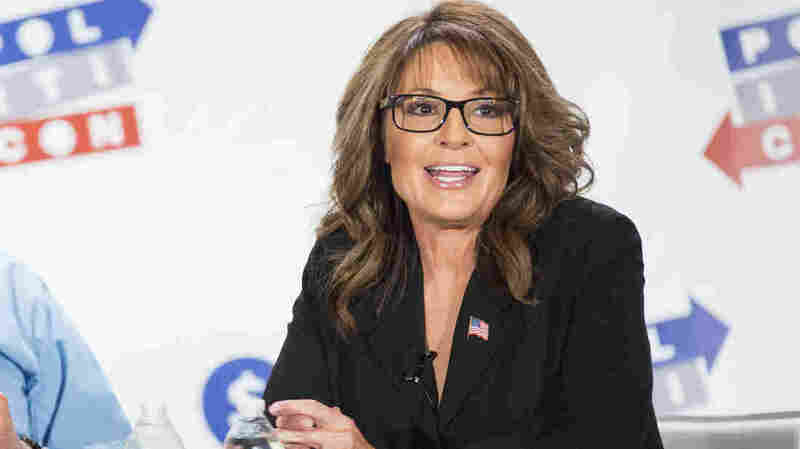 Sarah Palin filed a defamation lawsuit against The New York Times on Tuesday in a federal court in Manhattan. Palin, a former vice presidential nominee, says the newspaper published a statement about her in an editorial earlier this month that it "knew to be false." The editorial, which was corrected the next day, linked one of Palin's political action committee ads to the mass shooting in January 2011 that severely wounded then-Arizona Rep. Gabby Giffords. Lawyers for Palin say The Times "violated the law and its own policies" when it accused her of inciting the 2011 attack that killed six people. "The editorial was published online on June 14, the day a gunman opened fire at a baseball field where Republican lawmakers were practicing for an annual charity game. The editorial said there was a link between political incitement and the mass shooting in Arizona that severely wounded Representative Gabby Giffords and said that Ms. Palin's "political action committee circulated a map of targeted electoral districts that put Ms. Giffords and 19 other Democrats under stylized cross hairs." "The Times later issued a correction, saying that there was no established link between political statements and the shooting and that the map circulated by Ms. Palin's PAC had depicted electoral districts, not individual Democratic lawmakers, beneath the stylized cross hairs. The NYT Opinion Twitter account also sent out the correction about the lack of a link, apologizing and saying that it appreciated that readers had pointed out the mistake." The suit charges the newspaper's correction and apology to readers were "devoid of any reference to Mrs. Palin" and were "woefully insufficient." Palin is seeking damages to be determined by a jury, according to The Associated Press. In a statement, a spokeswoman for The Times said, "We have not reviewed the claim yet but will defend against any claim vigorously." In the June 14 shooting at the ball field in Virginia, Rep. Steve Scalise was critically wounded. The House majority whip has since been released from the intensive care unit but remains at a Washington, D.C., hospital.